Not only do they make your project's Github page look cooler, they also help developers, from curious potential users to regular contributors, easily spot how active and healthy is the code. 2. If this is your first rodeo, you'll see Travis CI asks for some permissions on Github. You must allow it to proceed. They have outlined the whys and hows if you're feeling cautious. 4. See that "on-off" switch next to each of your repositories? Just flick the ones you want to have a Travis CI report. We're almost done! A few moments after you commit it to your repository and push it to Github, go back to your Travis CI profile page and you should be able to see the build results! If you skipped a step and added the ".travis.yml" file to your repo before enabling the project in the Travis CI page, just push any commit to trigger it. After pushing your changes, go to your project's Github page and see the badge in all its glory! Now that we have Travis CI doing some tests for us, how about we get some test coverage reports also? That's where coveralls.io comes in! 1 & 2. Just like we did with Travis CI, go to the Coveralls home page and sign in with Github, granting them access to your repositories. 3. 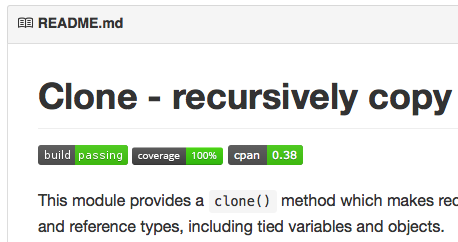 The Coveralls repository page will list all projects being analyzed for coverage, and now is probably the time to click the "add repos" button on that page and add the ones you want coverage analysis of. 4. Adjust your .travis.yml file to add code coverage. Coveralls is engine agnostic so we'll use the not nearly enough praised Devel::Cover suite to do the hard work, together with the Devel::Cover::Report::Coveralls interface. Basically, Travis CI gives us a lot of granularity while building and testing our projects, so we tweak it to include coverage commands in the appropriate build steps. - cpanm --quiet --notest --installdeps . To me this one looks much easier to read, as most of the complexity is enclosed in the "init" script of the well maintained travis-perl project. I highly recommend it. In fact, after you get it right for your code, I suggest you go read their helper intro and play with some settings, you won't regret it. Also, check out Moo's .travis.yml file for a glimpse of all the cool stuff you can get, from testing against blead perl to reporting on a specific irc channel! 5. Now that your commits are tested on Travis CI and reported by Coveralls (mind you, it might take several minutes for a build coverage to show up, and they only start after you push to Github *after* having activated Coveralls and pushed your .travis.yml file), let's put a badge on your README! 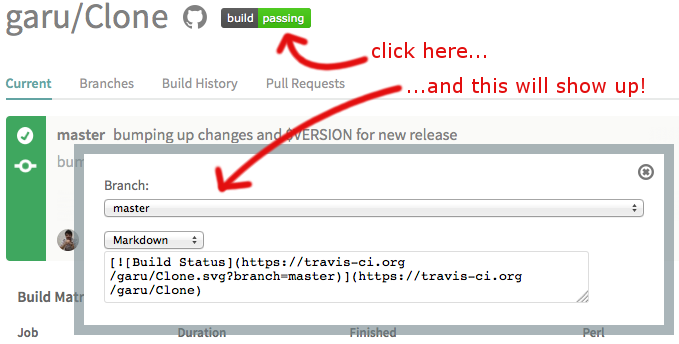 Put the markdown code on your README.md file next to the Travis CI badge (or wherever you see fit) and that's it! Now that your README.md is all shiny and colorful with badges, your project's Github page is starting to look even cooler than the MetaCPAN page, and that's just not cool. 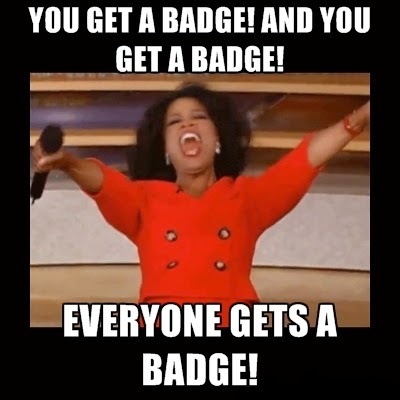 MetaCPAN's web interface is awesome and it will look even better when you put your brand new badges in it, so let's get on with that. Then this block will render the image when the renderer supports html (like the MetaCPAN web interface), and not do anything on renderers that don't support it (like your command line "perldoc"). Pretty cool, right? Graphic modules and tutorial-like documentation have been taking advantage of this feature for years, and we should too! 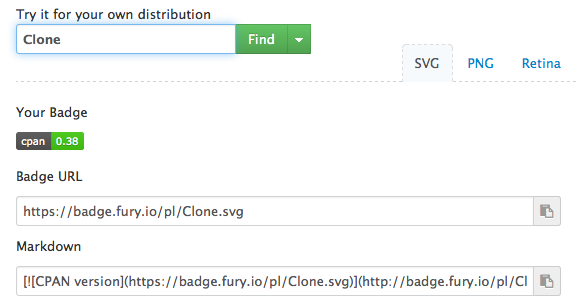 As soon as you push the new version to CPAN, you'll see the badges right there on MetaCPAN! Using the generic URLs shown above, the badges on the MetaCPAN pages will refer to the *last push to the repo* and not to the particular release that the unsuspecting potential user might be looking at on MetaCPAN. You can have a CPANTS badge too. Nice blog, Thanks for sharing such a useful and informative post. Disposable coveralls are used in a variety of industries, with the primary purpose of keeping people safe and protected from various types of fluids, dirt, bacteria and even flames. There are a variety of factors that you should consider before you put money down for a leather suit. Here are some tips that you should follow.